You view yourself to some extent – greater or lesser – as an artist as well. A Creator. You’d like for the world to read more of your books! The idea of selling your books to the world doesn’t exactly appeal to you. So what’s an author to do? How do you get people to read your books, without having to sell them? The bad news is that readers aren’t going to simply discover your books all on their own, without you doing anything to make that happen. So you are, kinda, gonna have to learn to sell. But sales and selling has gotten a bad rap over the years. It doesn’t have to be the painful process we so often imagine it to be. 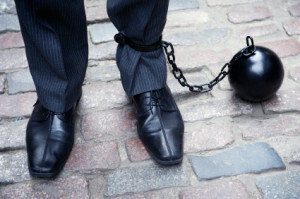 In this post, I intend to change how you view sales. The biggest problem that any entrepreneur faces – but especially authors – is that the thing you’re selling is also a thing that you CREATED. Creation assumes the fundamental, undeniable, irrevocable value of that which is created. It’s good … because someone valued it enough to create it. Selling is virtually the opposite. Our traditional attitude towards selling implies that the thing being sold isn’t intrinsically valuable. That there’s no obvious reason someone would want it, or pay money for it, or expend time or energy to get it. If there was obvious value to the Creation, there’d be no reason to have to sell it, right? People would be clawing all over one another trying to get it. So the only things that need to be SOLD are those things that don’t have obvious, intrinsic value. Given that this is our traditional, societal view of sales, it’s no wonder that a creator like you has a hard time feeling gung ho about selling your Creation. Because if your creation – whether that’s your book, or it’s another product or service you offer – has intrinsic value, then people should just KNOW that, right? They should simply want to buy it, without you having to sell it! And if you were to go out and sell it, wouldn’t you be calling into question its very value? To resolve this apparent paradox, what’s called for is a new paradigm for sales. It’s the paradigm that I call Sleaze-Free Selling. It’s a paradigm in which one’s creation is OFFERED, rather than SOLD. It’s a paradigm that assumes the intrinsic value of the creation … but which also takes into consideration the insane reality of our crowded, modern marketplace. In other words, it’s a paradigm in which you do need to take actions that allow your Creations to stand out in a crowded marketplace. But you’ll see very shortly here that these actions don’t need to be pushy, or make you feel self-conscious, or in any way give you the kind of heebie jeebies that make you not do them. Let me give you a concrete example of how beautiful – how poetic, even – Sleaze-Free Selling can be, so that we’re all on the same page. 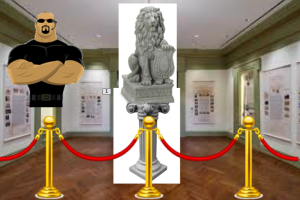 Imagine a statue, displayed on a pedestal… In the middle of a prestigious exhibit hall… With a red velvet rope on all sides and a stone-faced security guard at every door. That statue clearly has intrinsic value, right? And if you wanted to buy it, it would be understood that there would be a hefty price tag attached. And best of all, if you happen to be the Creator of that statue, there was no salesmanship needed to convey those understandings, right? No hawking, no high-pressure sales tactics … It’s simply understood by everyone who sees it that this creation has value, without anybody needing to sell it. No need to sell it? Really? Are you sure? Some of you already know where I’m going with this line of questioning, but to help the rest of you catch up, let me describe the opposite scenario. 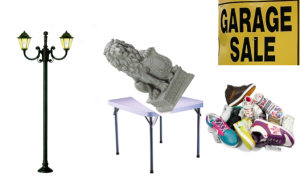 … between a broken lamp and a pile of old sneakers. And it hasn’t even been dusted. How valuable does this statue appear to be? How much would you expect to have to pay for it, relative to the identical statue that you saw in that fancy exhibit hall? Hopefully my point is becoming clear. Sales success isn’t about the words you say – your sales copy, your patter, the cold calls you make, the keywords you use online. It’s about your fundamental attitude towards what you’re selling. Sales success isn’t about the words you say – it’s about your fundamental attitude towards what you’re selling. It’s about you valuing your Creation, and then taking the obvious next steps to convey that value to others. Dusting it off, putting it on a pedestal, and placing a red velvet rope around it. Your role and your responsibility as author is to present your art to the world in this way. Not on some garage-sale card table. Your role and responsibility as author is to present your art to the world on a pedestal. The 7-Step Action Plan I’m going to go through with you in a minute explain how to do that, but before we continue let’s first address the elephant in the room. Namely, my premise that your Creation has value; and that you, the Creator, believe in the value of your Creation – enough to tell the world about it. And that’s not always true, is it? Don’t we sometimes doubt the value of our work? It can be painful to admit that, but radical honesty is the first step toward changing anything. If you want to sell more of your books, the very first step is to be honest with yourself about why you’re not. I certainly doubted the value of my work initially. When I first released my book, The Entrepreneur’s Guide to Sleaze-Free Selling, I had no idea if it was any good or not. I needed external validation – in the form of a Top 1000 Amazon Reviewer, who specialized in the area of sales books. I reached out to this guy and BEGGED him to review my book. He agreed, and I spent the next 10 days while he read it and wrote the review, on pins and needles, waiting to hear if he thought my book was a pile of crap. You can imagine how relieved I was when he told me that not only was it not crap, in his opinion it was one of the better sales books he’d read. In his words, I had actually come up with some new ideas about sales that were needed in our modern world. That validation was an absolute turning point for me, as far as my ability to promote my book. I now felt total confidence that my Creation was good. And this confidence is what allowed me to go out into the world with my book in a big way and take the actions I needed to take for my book to hit the Amazon bestseller list. You’re comfortable charging a fair price, because it wouldn’t feel good to you to sell your Creation for less than it’s worth. The idea of telling people about your Creation seems natural and easy, instead of making you feel embarrassed or hesitant. You don’t have to be pushy, because you know that if this person doesn’t buy, someone else will. And perhaps most of all, it doesn’t devastate you when someone says no. Because you know your Creation is good. And any one person’s decision not to buy it doesn’t change that fact. Helping you to achieve that mindset – to believe in what you’ve Created enough to get out there and sell it in a big way – is what I really specialize in. If you know that you have significant emotional and mental blockages to the very idea of selling, I can probably help you. Whatever your blockage is, I can identify it. And then I can help you clear it. So you no longer feel the resistance to selling, and you’ll finally be able to take the kinds of actions you know you need to take, in order to make your books successful. In order to make your books – and you – more visible to a larger audience. For my detailed Action Plan, “How to Take Your Book From Garage Sale Reject to Exhibit Hall Masterpiece in 7 Easy Steps” please give me your email address and it will be on its way to you! Complete the form below to receive my 7-step action plan.